My interview on Quirks and Quarks is now available online. I am pleased with how the interview went. I was probably interviewed for about 15-20 minutes which the producers did an excellent job condensing down to 10 minutes. One of the things cut though was the acknowledgement that the work was done at the University of Toronto in Aephraim Steinberg's lab (my PhD advisor). A big thanks to everyone who helped me prepare for this, and a shout out to Colin Hunter and Kim Luke for helping to arrange the interview. If you are interested, here is a posting that lists all of the media coverage our paper has received. I also wrote a post about my experience being interviewed on Quirks and Quarks. 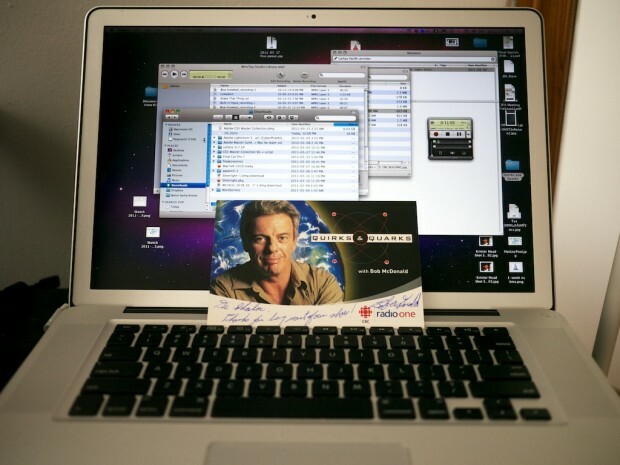 Finally, here is a picture of me listening to the interview with my signed postcard from Bob McDonald.